Our Library is the Second Least Funded Library by Taxpayers in the Whole State! Statistics pulled from the NYS Department of Education show that of libraries with a similar population size the Canajoharie Library the smallest amount of tax revenue in the entire state. 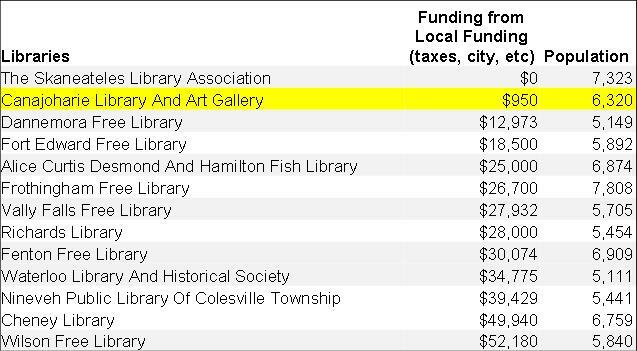 Below is a detail of the list of over 100 libraries with a similar population size to our community and how much they get from local taxpayers. Click the .xls spreadsheet at the bottom of the page for the full listing. What does this say about our community?